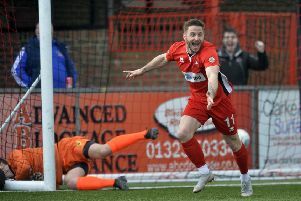 Eastbourne Borough's Dean Cox had a loan spell at Burgess Hill Town during the 2016/17 season. Picture by Steve Robards. Simon Wormull is looking forward to pitting his wits against former club Eastbourne Borough, as his Burgess Hill Town side host the Sports in tonight's Sussex Senior Cup quarter-final. Hill have overcome Bexhill United and Pagham in the competition so far, while Borough have notched up victories against Eastbourne United and Horsham. The Hillians' opponents sit 14th in the National League South, having picked up 34 points from 27 games. Wormull played for the Sports during the 2008/09 season, scoring twice in 29 appearances for the club. The Burgess Hill boss is anticipating a stiff test against the division-above outfit, but feels that his team's performances in 'one-off games' gives them a great opportunity to advance to the semis. Wormull said: "It's going to be a challenge and they've got some great players. I think Sergio Torres is injured for them but you've got Coxy (Dean Cox), and you've got Lloyd Dawes. "I know Jamie (Howell, Eastbourne Borough manager) very well. I played with Jamie as a youngster and he's a very good footballer and obviously they're going to be a very good football team. "It's going to be a tough, tough game but it's a one-off thing. We're good at these one-off games and I think it's the sort of game where you don't need any kind of motivating. You know what you want to do. "I like to pit my wits against better teams and I think what Eastbourne have done is great but when it comes down to it all I want to do is win. With the teams left in the competition there's a great opportunity if we win tonight to progress to the final." Ahead of tonight's cup tie, Wormull also revealed that his side would be missing three key players but has challenged his squad 'to show people what they're made of'. He added: "Aaron Smith-Joseph is out injured, Dan Beck's injured and Tom Cadman. Hopefully Tom and Dan might be fit for Saturday but I think tonight has come a bit too quick for them. "Aaron's still got a couple of weeks. He's got to have an injection in his back so he just needs a week or so to rest. "I want the boys to show people what we're made of. I said that in my programme notes tonight, I want the boys to go and express themselves and show how good they are. "My lads are a really good group. They're honest in their endeavours and I want them to show that tonight because they're in the shop window. "There's an opportunity for them and I think it'll be a great derby game. With the way both of us play I think it'll be an entertaining game."